We have all heard of the famous idiom - “Every cloud has a silver lining”. What does this mean? Have you ever noticed how some people seem to handle difficult situations better than others? This is exactly what it means. When life clouds over you, and stressful times take over, it is easy to get depressed and give up. However, just like a ray of sunshine spills out of the edges of a dark cloud (silver lining), an optimistic individual tends to see the good in bad. Unlike what most people believe, optimistic people do not move around sparkling fairy dust over bad situations and events. Nor do they see the world through rose-tinted glasses. They just work out a better approach to deal with bad experiences. Optimism has other positive effects too. 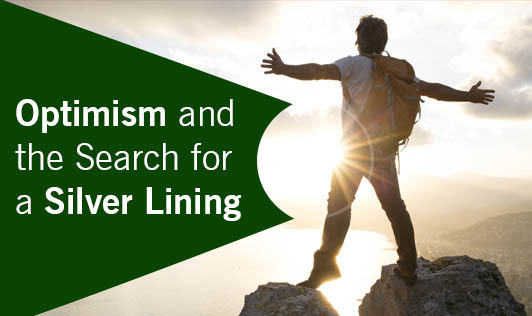 Apart from having a half-full glass attitude about life, optimists display better physical and mental health with lower signs of depression and anxiety. They also form healthier relationships, display better coping mechanisms, experience greater success at work or school, and even manage to recover sooner from illness or surgery. Hope for the Future: Optimists are generally more hopeful people. Regardless of what the present situation may be, they always see their future as bright and successful. Eyes on the Prize: Optimists are not let down over the negative opinions of others. They do not let themselves be pulled down at any time and always have their eyes set on the final goal. They know where they are headed and are always focused. Maintaining Perspective: Good times come and go for an optimist. They know it is a part of life and that they will have to deal with it at one time or another. Hence, when faced with difficult situations, they do not create drama. They simply step back and see the bigger picture. Self-Confidence & Belief: Pessimists tend to get crushed during adverse situations. Optimists carefully analyze the issue, evaluate it, find solutions or alternatives, and implement them. This behavior always gives them the ability to control the environment around them, making future issues, easier to tackle. Untouched & Unattached:While pessimists see negative situations as temporary, external factors (meaning they blame themselves for the end result and assume that this is going to last forever), optimists see such situations as unchanging, internal factors (meaning the result was out of their control, and is only temporary and a small part of my life).